ATTray is a program for controlling your AudioTron from your Windows system tray. It installs a system tray icon that allows you to perform many of the common front panel functions right from Windows. Please feel free to contact me with any questions, problems, bugs, feedback or anything else. I want to know what you think. Q: Do you have an example of how to use the Web Update feature? New Release This release fixes a bug introduced by a Microsoft security patch on 02/02/2004. This pertains to the “Web Console” menu item. If you don’t use that this release is not important. New Release This release fixes a long standing bug where artists that had songs with album tags and without album tags would not list the untagged songs. Everything is now listed properly. There is a small performance hit for this, but a future version will clean that up as well. New Release This release is mostly just a few bug fixes. Songs without an album tag will appear correctly now, the tree updates a little faster and ATTray will no longer leave rogue .toc files laying around screwing everything up. “Advanced Features” in the configuration. out the bottom of the ReadMe.txt if you want to see all the dirty details. a small bug that would break titles that had a ‘n’ in them. Sorry about that. Nothing else in this release. Just a small bug fix. position of the song. You can drag the slider around to fast forward or rewind. for the next release. Anyway, download and enjoy! as big as the ENTIRE rest of ATTray, so there is plenty to look over. new features for ATTray, which is the reason for the slow down in releases. of the MP3, a user specified directory and finally it will try to download the art from Amazon.com. In the case that ATTray can’t find art work for the currently playing song you can drag a file to ATTray and it will save the art in it’s local repository with the option of saving it in the MP3 file as well. What all this means is that I have had to learn how to do XML, Drag and Drop, JPG decoding and image display in Win32, all of which is new to me 🙂 Anyway, lots of new code in this upcoming version so expect it in another week or so. I’ve been getting lots of great feedback about the program and it seems like I’ve implemented most of the requests that people have given me. If you’re favorite feature isn’t in ATTray yet, let me know! Note: I have started using an installation system for ATTray. should work as they always did with old firmware. See the bottom of the ReadMe.txt file for changes and new features. The highlights are that ATTray can now show your digital music library, queue up songs and basically everything else you can do with the front panel or remote. I just bought two Audiotrons cheap on Ebay and was thinking about writing some code using the Audiotron API and found your program on the web. Great application! This is just what I was looking for! Controlling the Audiotron with the web browser was boring due to the sluggish performance. 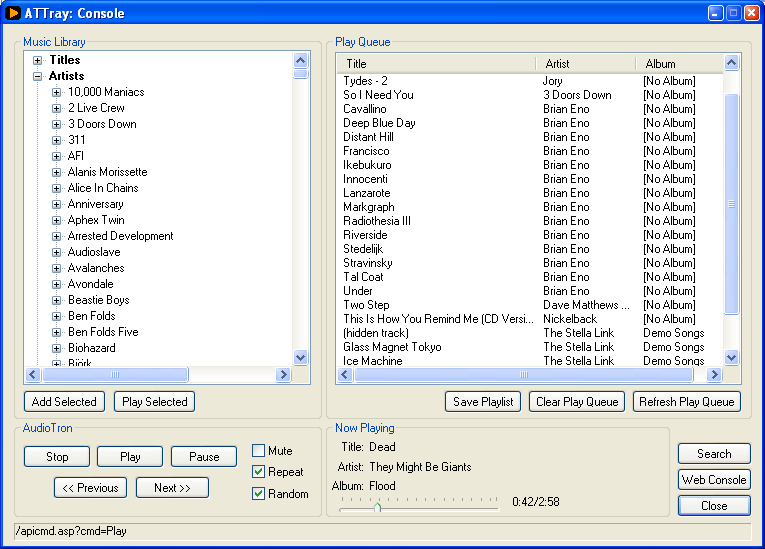 I also REALLY like the playlist feature, as the lack of a persistent playlist was a major product shortcoming. I have been living in Germany for the last 25 years, but I grew up in Seattle and enjoyed your pictures of the Seattle area. I have not made a donation, but if you get to Frankfurt, I will buy you a pizza. I started to use my Audiotron in my office, so I searched for a tiny piece of software to control the device from my windows desktop. I found your work – and it works really fine! Thank you very much from across the ocean!